– The opening cutscene with Fenix, Pentagon Jr. and Catrina was a fine set-up to the match. Pentagon was always looking to get a piece of the gold and made his threat known, while Catrina showed up to throw her weight around, saying that she didn’t invite Pentagon to the match after he put his hands on her. She also kept things brewing with Fenix, making it known she was confident that he’d take his last breath and Muertes would get back his Title. – LUG was smart to hook people in for season two with the signing of Rey Mysterio, since he’s arguably the most popular luchador on the American market due to his WWE years. He’d been appearing on recent episodes as a mentor to Dragon Azteca Jr., but the moment was here – his Temple debut right in Aztec Warfare. That alone had us hyped and actually looking forward to the match. Fenix came out as the first entrant as expected, followed by Mysterio. Monster pop. People there probably didn’t expect that. Their brief face-off didn’t disappoint, with the respect factor rampant. King Cuerno was the next entrant and besides for an impressive straight arrow-esque suicide dive, he wasn’t a factor. Argenis also made his return, but also was a non-factor. Johnny Mundo had a good showing, mostly continuing his feud with Cage, as they traded finishers and smashed office windows. Ultimately, Mundo got the last laugh by clobbering a cinder block over Cage’s head, allowing Taya to get the pin. We also saw some nice advancements in the Drago/Aerostar-Jack Evans/PJ Black feud, as they battled it out for some time. Joey Ryan also had some comic relief moments, his cunning plan of handcuffing himself to the barricade backfired when he became a standing duck for many kicks and strikes. The action was all over the place simultaneously – the bleachers, the floor, the ring, etc. This was shaping up to be even better than last year and then we reached the turning point of no return. Obviously, Muertes’ moment in the match backfiring with Pentagon attacking him and then getting pinned by Mysterio was huge and eliminated the instant threat to Fenix. The biggest moment came from Dario Cueto’s return upon a big pop as he then introduced his monstrous brother, Matanza Cueto. He has a Braun Strowman-esque build to him, but could sell and also do some slight flying to stay close to the lucha libre way. What seemed to take fans out of the match was the fact that he pinned Fenix first, which guaranteed a new Champion. With Catrina running the Temple with an iron fist and lick of evil death, Cueto actually presented something fans wanted to cheer. That said, why did they need to do it all at Fenix’s expense, since all we got was a one-week Title reign most notable for the match wrestled to start it than anything else? It would’ve made more sense to keep the belt on Muertes in that case. Could’ve told the exact same story. He then pretty much demolished the rest of the competitors in the match, mostly tecnicos with some rudos thrown in the mix. The crowd didn’t seem too warm to this idea and they definitely packed too much into one episode. That said, Mysterio lasted to the end and actually had us believing he could perhaps overcome Matanza, but it wasn’t to be. Matanza emerges the new LUG Champion. Now, it was a hell of a way to debut a monster figure, but again, our gripe with it was throwing Fenix to the wayside again. It shake things up and we’re stoked that Cueto’s back and are curious where Catrina will factor into the equation, but we question the decision to go all the way in this. Oh yeah and bonus points to Famous B’s cameo appearance, who handed out business cards to everyone there, showing interests in potential clients. Maybe he’ll make us famous one day. 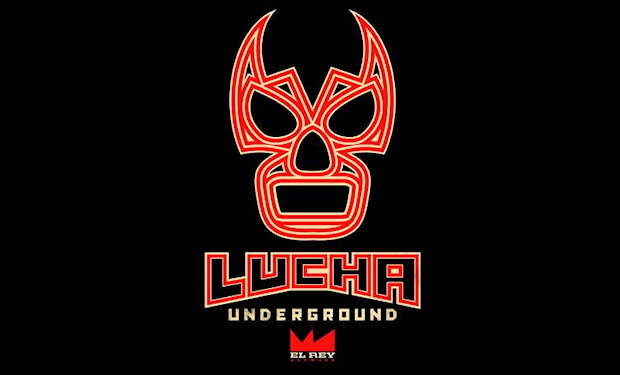 Posted on March 31, 2016, in Lucha Underground and tagged Aerostar, Argenis, Cage, Catrina, Chavo Guerrero Jr., Dario Cueto, Drago, Dragon Azteca Jr., Fenix, Jack Evans, Joey Ryan, Johnny Mundo, King Cuerno, Marty Martinez, Mascarita Sagrada, Matanza Cueto, Matt Striker, Mil Muertes, Pentagon Jr., PJ Black, Prince Puma, Rey Mysterio, Taya Valkyrie, Texano, The Mack, Vampiro. Bookmark the permalink. Leave a comment.